This companion to the bestselling Introduction to Health and Safety in Construction is an essential revision aid for students preparing for their written assessments on the NEBOSH National Certificate in Construction Health and Safety. Fully updated to the April 2015 specification, the revision guide provides complete coverage of the syllabus in bite-sized chunks, helping readers to learn and memorise the most important topics. Throughout the book, the guide links back to the Introduction to Health and Safety in Construction textbook, helping students to consolidate their learning. 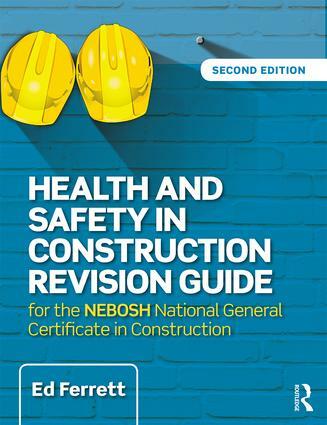 The Health and Safety in Construction Revision Guide, written by the renowned health and safety author and former NEBOSH Vice Chairman Ed Ferrett, will be an invaluable tool for students as they prepare for their NEBOSH exam and for their subsequent health and safety work. Ed Ferrett is an experienced health and safety consultant who has practised for over 25 years. With a PhD and an Honours Degree in Mechanical Engineering from Nottingham University, Ed spent 30 years in Higher and Further education, retiring as the Head of the Faculty of Technology of Cornwall College in 1993. Since then he has been an independent consultant to several public and private sector organisations including construction businesses, the Regional Health and Safety Adviser for the Government Office (West Midlands), and was Chair of West of Cornwall Primary Care NHS Trust for 6 years until 2006. Ed was a member of the NEBOSH Board from 1995 until 2010 and Vice Chair from 1999 to 2008. He has delivered many health and safety courses and has been a lecturer in NEBOSH courses for various course providers. He has been an External Examiner for an MSc course and BSc course in Health and Safety at two UK Universities, a Reporting Inspector for Independent Further and Higher Education with the British Accreditation Council and a NEBOSH Ambassador. Ed is a Chartered Engineer and a Chartered Member of IOSH.